With all the concern about climate change, it is important to remember that natural climate variability, including El Niño, La Niña, and the Pacific Decadal Oscillation (PDO), remains an important – and on shorter time scales, a dominant – influence on Pacific Northwest climate. These two signals – natural variability and human-caused climate change – work together to shape Pacific Northwest climate at any given point in time, as explained in the following sections. Statistics courtesy of the Office of the Washington State Climatologist. PDO statistics for the period for June 1998 through February 2013. Figure 1. Plot of annual Pacific Northwest temperature for 1895-2010 (black dots and line), with trend lines for various starting points (colored lines). Lines sloping up indicate warming (“positive”) trends for that period. Lines sloping down indicate cooling (“negative”) trends for that period. Data were obtained from the National Climatic Data Center (NCDC, ftp://ftp.ncdc.noaa.gov) and updated following Karl et al. (1986) and Easterling et al. (1997). Because PNW climate is strongly influenced by natural variations such as these, we can (and will continue to) have 10 to 60 year periods of local and regional cooling even as global and regional climate warms over the long-term in response to rising greenhouse gas emissions. Figure 1 shows that annual PNW temperature has declined slightly since the mid-1980s even as the region warmed over the longer-term. In addition, because of our proximity to the Pacific Ocean, which is warming more slowly than land areas, PNW warming is expected to be slower than the global average. Natural variability could continue to have a larger influence on PNW temperatures than human-caused climate change for the next 20 to 30 years or so. One reason is that the region is currently in a cool phase PDO that could persist for another decade or longer. This does not mean that human-caused climate change is not occurring, nor does it mean that warming is not having an impact on the PNW. 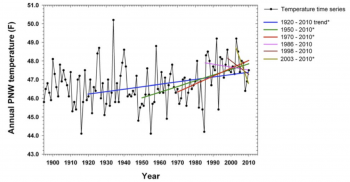 It simply means that the year-to-year and decade-to-decade variations that are a natural part of our climate have recently diminished the influence of greenhouse warming on regional temperatures. The ongoing influence of natural variability must be considered when projecting and preparing for future conditions. 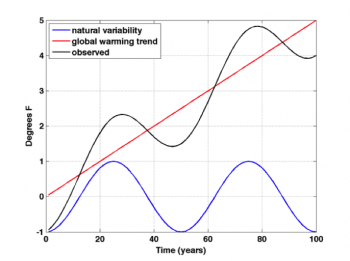 This influence is not always evident in commonly-provided climate change scenarios, many of which have been averaged to smooth out the substantial, but mostly random, fluctuations in climate associated with natural variability. This smoothing makes it easy to forget that we will continue to see warmer than average years and cooler than average years moving forward in time even as the average around which temperatures vary is increasing (Figure 2). Figure 2. 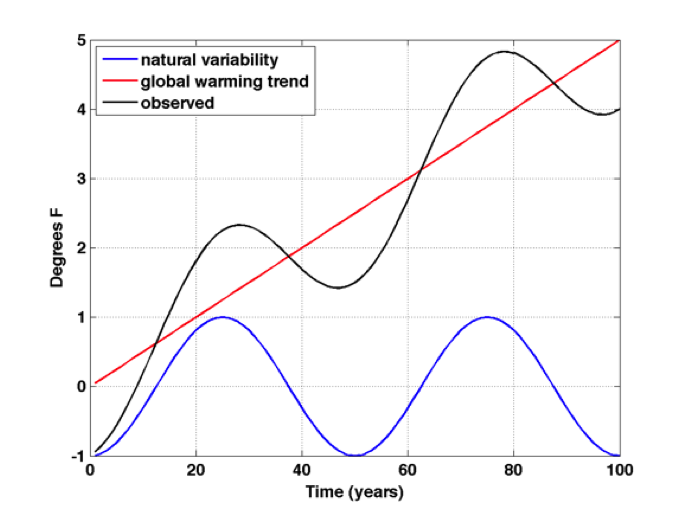 Observed climate trends (black line) will vary in real time as a result of the combined effects of natural variability (blue line) and human-caused global warming (red line). Figure source: Climate Impacts Group. Recognizing the importance of natural variability in shaping regional climate helps resource managers and planners (1) place projected climate change in the context of the natural variability they already consider in management, and (2) keep the underlying longer-term warming trend in mind during the inevitable periods that don’t follow the “simple” trends resulting from global warming projections alone. Most importantly, short-term cooling trends and their effects, such as the abundant snowpacks of the last few winters, do not disprove the changing climate of the PNW. All climate model projections for the PNW show warming in the 21st century and even the lower warming scenarios – which are becoming less likely given the continued rapid growth in greenhouse gas emissions – are expected to have real impacts on Washington’s communities and natural resources. Climate change is a continuing problem with the most significant warming still to come.